Though just one-in-three voters have a favorable opinion of freshman Representative Alexandria Ocasio-Cortez, if she were old enough to run for president in 2020, she’d give President Trump a run for his money, writes The Rasmussen Reports. This is remarkable for someone just coming onto the political scene, but I spotted her as trouble before she even won her seat, and before mainstream media even knew who she was. I repeat, AOV is extremely dangerous. And she is only 29 years old, when she really figures out what she is doing, watch out. She has Lenin strategy in her blood. To compare, we'll need a poll on Trump v. Ham Sammich (D). The idiots comprising the Idiocracy are now an overwhelming majority and they deserve the POS eventuality that the clueless following of socialism entails! Ya know, for the longest time I couldn't remember her name. 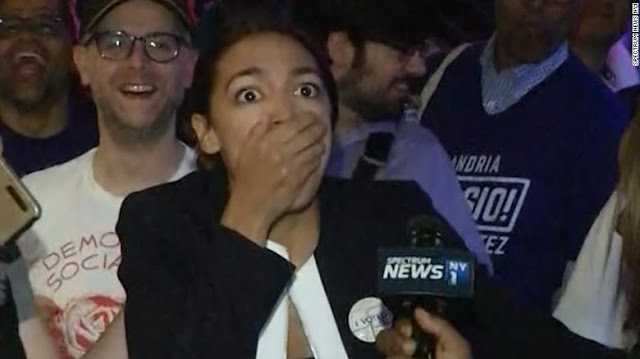 Then I read a comment by some genius who dubbed her: "Sandy Occasional Cortex", and I'll never forget again.